A couple of years ago, I brought home some photos from my childhood, and looking through the scans, apparently most of them were Christmas pics. That’s perfect for this League of Extraordinary Bloggers assignment: tell a Christmas story from the past. I’m going to tell a few stories, with pictures! I wish I still had this Fisher-Price house. That doorbell was such a happy sound! This is Christmas 1981, I think. It was a very Fisher-Price Christmas. 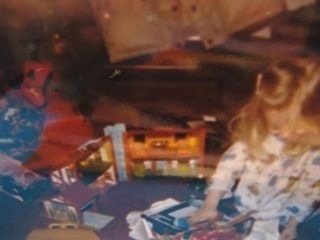 You can see that I got the Fisher-Price house, which I played with so much. I think this was the only Fisher-Price building I ever had, though I remember playing with the barn and others at school and at friends’ houses. I also got a doctor kit this year, and I’m thinking this might be when I got the Fisher-Price play stove or the portable chalkboard with magnetic letters. Remember how awesome Little People were in the 70s and 80s? I loved their generic body shapes: the hourglass lady shape, the kid shape, the broad-shouldered man shape. My Little People family was a blonde mom with a blue dress, a Charlie Brownesque dad in green, a Peppermint Patty-like little girl, and a baby. Oh, and the dog. Of course, the dog. I don’t know what year this is. I’m still young enough to have my light blonde hair (before it turned into dirty dishwater blonde). That box looks like it has clothes in it. From childhood through adolescence my Granny bought me clothes that were either not my style or the absolute wrong size. Thank goodness JCPenney had a relaxed return policy. Oh! This might be the year I got the Fisher-Price Muppet stick puppets. Those things were super fun. 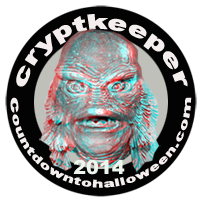 I have a few I’ve picked up on my travels, since I played with mine in the bathtub and they molded. My mom had to fight the ravenous hordes to get this Cabbage Patch Kid, and there was no way I was gonna let her go. 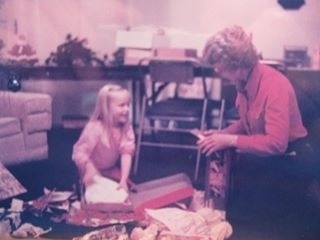 This is Christmas 1983. I’m 5 here. The doll in my clutches is one Viola Roxie, whose name for some reason I changed to Mandy Rose. She is from the first batch of Cabbage Patch Kids, and she was not easy to get. I imagine my mom having to don riot gear just to get her. My mom is pretty awesome. Remember how the birth certificates had the parental oath on the back of them? I made my mom read it for every CPK I had, and I cried every time I repeated it. I took pretend motherhood very seriously. I had a couple other Cabbage Patch Kids over the years, but Mandy Rose was the most special. This is the same Christmas. (What an awesome Christmas!) Here we have Crystal Barbie and Ken, the most ’80s-est of the ’80s Barbies. Her dress and Ken’s vest were this plastic-y iridescent material that was rad. She had the most elaborate hairdo I’ve ever seen on a Barbie, and I remember my mom threatening me if I took her hair down. (Not like bad threatening or anything, just like “If you take her hair down, that’s it. She’ll look terrible.”) The best part of this Barbie was her crystal pumps, which were cast in this smoky clear vinyl with glitter. Incidentally, this was my first Ken, since My First Barbie was a confirmed bachelorette. This box in front of me is filled with Rainbow Brite stuff. FILLED! ALL THE RAINBOWS ARE MINE! 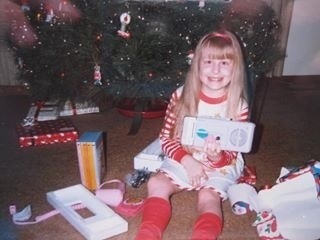 I’m going to guess this is Christmas 1984. But wait. The ornaments are in the same place as the previous pics, so could it be that I got a Cabbage Patch Kid, Crystal Barbie and Ken, AND Rainbow Brite all in the same Christmas? I’m just gonna go ahead and say I’m the luckiest girl in the world. (I think that anyway, by the way.) I remember my Mammaw and Pappaw bought these for me. 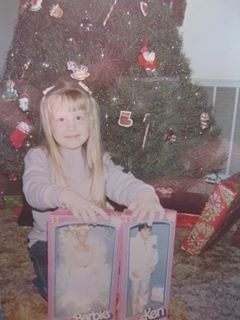 I got the big Rainbow Brite for my birthday one year, but these were the smaller dolls. I got Rainbow Brite, Canary Yellow, Starlight, and Rainbow Brite’s Color Cottage. This thing was rad. It was parachute material, shaped like a dome. The roof was a rainbow, and it snapped shut, but when you folded the front down, it revealed a bed, dresser, and something else (a table, maybe?). I was all about the playsets. I played with this thing like crazy, and it’s one of those things that I am KICKING myself I didn’t keep. I have to find one now. Brace yourself for this one, kids, because it is without a doubt the all-caps, multiple exclamation points, BEST CHRISTMAS EVER!!!!! 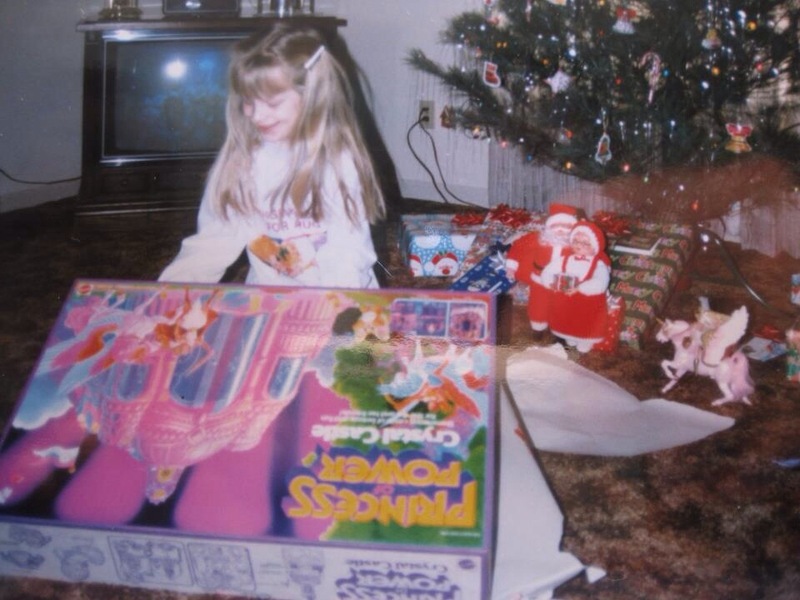 It was Christmas 1985, and it was all about She-Ra, Princess of Power, who rounded out my Holy Trinity of Self-Rescuing Princesses (Princess Leia and Wonder Woman were the first two). Not only did I get She-Ra’s Crystal Castle, I also got She-Ra, Swift Wind, Catra, Angella, Glimmer, Frosta, and Castaspella. Look at that box art! Say what you will about Masters of the Universe and Princess of Power, but they had top-notch box art. I saw a boxed Crystal Castle at the Chicago Toy Show this year, and though I have a complete Crystal Castle at home, I had to resist the urge to buy that thing for the box. The nostalgia is strong with this one, for sure. I don’t have to tell you (at least if you know anything about me at all) that Princess of Power is my favorite toy line of all time. Here are some funny facts about this particular Christmas. My mom and I broke Angella not long after we opened the package. Legitimately broke the pegs off her wings. As such, my Angella was grounded. And as I recall, we did something to mess up the elevator in Crystal Castle. It’s not that we broke it or anything, but I remember it being wonky. (Incidentally, we can also be blamed for a post being crooked on the deck at my parents’ house, since we were laughing while my dad was trying to straighten it. We are adorable disasters, my mama and I.) Much like Ralphie and his Red Ryder BB Gun, I slept with my Princess of Power figures (dolls? ), especially since Glimmer’s staff and crown glowed in the dark. Hi, my name is Stacey, and I’m an ’80s girl! Totally tubular! 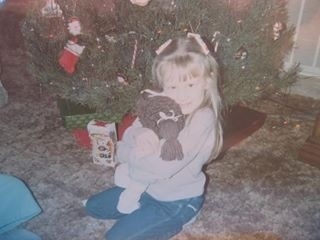 This is Christmas 1986, and I’m 8. Yes, that is an LA Gear pink hairdryer. The books are a boxed set of Judy Blume’s novels for the younger set like Tales of a Fourth Grade Nothing, and Superfudge. Also included in this collection for some reason is Are You There, God? It’s Me, Margaret. My entire childhood I read everything I could get my hands on, and I remember trying to read this one maybe a few months after this. I comprehended the words on the page, but not the concepts, since it was written about a teenager and, um, the weird things that happen to preteen/teen girls. I remember how awesomely my mom handled it, though, when I asked her questions. She explained it in a way that I could understand and suggested I shelve that book for a couple of years. But let’s talk about that purple tape player. Of all the electronics I owned as a child, this and my Fisher-Price record player are the two I wish I could reach through time and grab. I remember coveting this thing from the moment I saw it, and when I got it for Christmas, I was ecstatic! It was purple, and the buttons on the top were varying shades of pink, turquoise, and other ’80s colors. 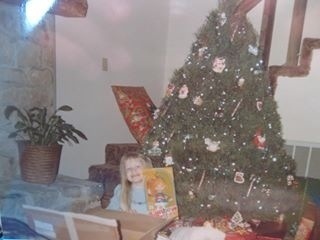 Not pictured in any of these photos are other things I got for Christmas, like Muppets, Sweet Secrets, Charmkins, Popples, Tinkerbell makeup, Get In Shape Girl ribbon dancer kit, puffy stickers of things like Barbie and unicorns, and books, books, books. So what about you? What are your favorite past Christmas memories? Tags: Christmas, league, league of extraordinary bloggers, loeb, nostalgia, toys. Bookmark the permalink. It’s awesome that you have all those photos. We must be around the same age because I remember my sister getting some of the same toys when we were kids. I def remember the Cabbage Patch riots! LOL. Great read… hope you have a Merry Christmas!